v.hull - Produces a 2D/3D convex hull for a given vector map. v.hull computes the convex hull of a vector map and outputs the convex hull polygon as a vector area map. The convex hull, or convex envelope, for an object or a set of objects is the minimal convex set containing the given objects. 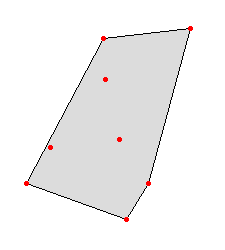 This module creates a vector polygon containing all vector points or lines of the input map. In the case of 3D input points, the hull will be a 3D hull as well, unless the user specifies the -f flag. The 3D hull will be composed of triangular faces. M. de Berg, M. van Kreveld, M. Overmars, O. Schwarzkopf, (2000). Computational geometry, chapter 1.1, 2-8. J. O'Rourke, (1998). Computational Geometry in C (Second Edition), chapter 4.